Samples are exposed to a simulated environment such as a naval ship to test the connector’s mating durability and optical performance. Testing to MIL-PRF-28876 (General Specification for Fiber Optic Circulars Connector, Plug and Receptacle Style) qualifies circular plug and receptacle style fiber optic connectors with multiple removable termini for the use of a wide variety of naval ships. The design of potential MIL-PRF-28876 fiber optic connectors (shell sizes 1, 6, 10, 11, and 15) is provide a flexibility to be mated to other connector plug and receptacle setups. The removable termini (defined and specifically tested in MIL-PRF-29504) makes it possible to mate and de-mate a plug and receptacle to any installation scenario such as making a straight connection, mounting the pair on or through a wall, a connection established at a 90° angle, etc. At the same time however, the connection must be durable enough to prevent any interference to an optical signal from certain test scenarios such as climate conditions, shocks, and vibration, while installed on a naval ship. At times, a naval ship may potentially find itself in harsh environments and combat. During instances like these, the connector must continuously provided information through its singlemode and multimode fibers and must be durable enough to not disconnect. 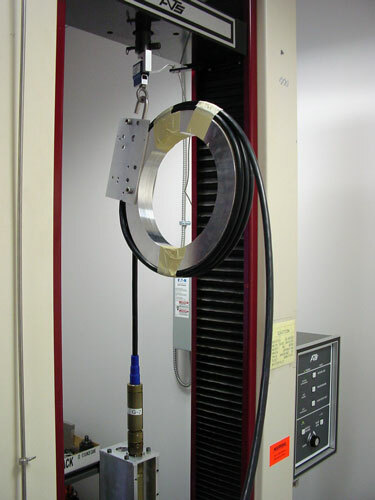 The environmental and mechanical tests in MIL-PRF-28876 replicate harsh instances such as sharp changes in temperature (Thermal Shock testing measures the optical performance of the samples with the effects of cable shrinkage at a temperature extreme per TIA/EIA-455-71 Schedule C) high-shock impacts (MIL-S-901) to that of a missile or torpedo, and Fluid Immersion to simulate exposure to liquids other than seawater while testing the endurance levels of the connector samples (as per the conditions in TIA-455-12).